Days gone by…. A piece of the past in this special location close to Downtown Williams. Let our quiet, spacious Inn with beautifully furnished rooms immerse you in the simplicity & peaceful surroundings of the Bill Williams mountain with an elevation of 6,770 feet. We welcome you to Williams – Gateway to the Grand Canyon where cowboys, horses, vintage cars and motorcycles are as much a part of the picturesque landscape as the blue sky, sunshine and fresh, clear air. Experience Williams, Arizona's four-season climate that cultivates wild flowers in spring, sunflower-fields in summer, orange oaks and golden aspens in the fall and fluffy white blankets of snow in winter. Cool summer temperatures, highs of 80s during the day & lows of 60s at night. Williams, Arizona has a lot to offer; the “Grand Canyon” Railway has a daily two-hour train trip to the “Grand Canyon National Park.” While staying near the Grand Canyon, take time out to see the Indian ruins and reservations, the Painted Desert, Monument Valley and Petrified Forest or any of the other hidden wonders of Northern Arizona. This self contained Inn has four rooms, each with their own distinctive furnishings. 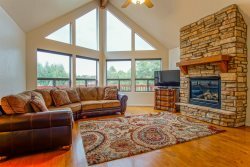 Enter in through the main front door and you are welcomed in to a beautiful open Lobby with two separate seating areas, complimentary snacks, beverages and comfy chairs to relax in front of the stone fireplace. The quaint HEATHER ROOM has a Queen size bed, accentuated with beautiful beige/pastel flowers embroidered around it and decorative pillows, two-high back chairs, armoire, flat-screen T V- Directv, overhead fans, fireplace, private entry, private bath with Victorian claw-foot tub/shower, & beautiful hardwood floor with accent rug. Access to the outside through a private screen door takes you on to the wrap around deck. With the mountain back drop and steam engines passing through, this really does make you feel like you have stepped back in time, yet you are just a few minutes drive from Downtown Williams, abuzz with modern and more traditional eateries and breweries. There is a pack & play available. The Heather Room is located in an Inn. It is not a Bed & Breakfast. This property is professionally managed by Kathryn Duncan, Designated Broker of KD Prime Properties. Television: There is a flat screen television in the Room. Variety of reading materials and books. Claw-tub bath with bath/shower attachment, vanity. There are no Washer/Dryer facilities but laundromats can be found in town. We supply freshly cleaned linens, bedding, and towels for all our guests. We do supply shampoo, conditioner and body wash . Although often there will be a variety of snacks, coffee, etc., we cannot guarantee what will be available. In the main lobby in the cabinet to the right of the fireplace, you will also find complimentary bottled water.